Do you have a minute to spare to learn some English? Let Tom tell you the truth about the future perfect continuous tense. Give us 60 seconds and we'll give you the English! 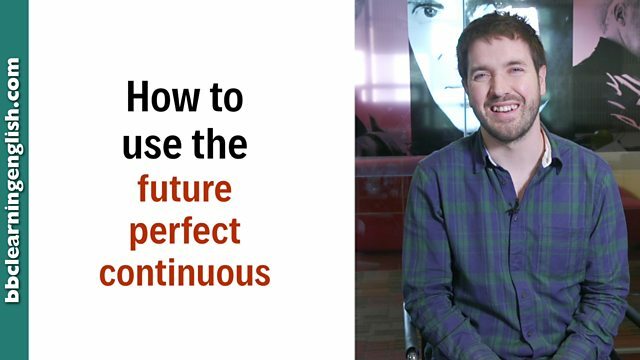 Hi, I'm Tom and today I'm going to show you how to use the future perfect continuous. When we use the future perfect continuous, we imagine ourselves at a point in the future and we then talk about a continuing action which leads to this point. Let's practise. At the start of the next scene, I will have been eating noodles for five minutes. We make this tense using subject + will have been + (verb)ing. For example: At lunchtime, I will have been working for four hours. And we can also use won't to make the tense negative. The future perfect continuous tense is formed using: will (or won't) + have + been + (verb)ING. I will have been learning English for five years come this July. It's too soon. I won't have been working for long by then. Come later. The next time we meet will be in 20 years! What will you have been doing by then? We use the future perfect continuous tense to talk about an action that will still be in progress at an imagined time in the future. We often use the future perfect continous in relation to talking about durations - especially with the prepositions 'for' and 'since'. At the start of the next scene, I will have been eating noodles for five minutes. At lunchtime, I'll have been working for five hours. She'll have been travelling to work on the same bus for 20 years. Unless obvious from the context, we often specify a time when using the future perfect continuous. Time expressions using 'by' are common, especially in relation to the end of a future time. E.g. by the end of the day. By the time I get home, she will have been working for 45 extra minutes. He won't have been travelling for very long by the end of November. Give him more time. Remember, it's the FUTURE (+) PERFECT + CONTINUOUS. Think about the separate formulas for all three of these tenses and combine them! Which formula for the future perfect continuous is correct? Which preposition do we use to indicate the end of a future time? Complete this sentence with the correct time expression: It's 9am now. ______, I'll have been cooking for 12 hours without a break! The future perfect continuous tense is used to talk about an action which is still going at an imagined future time. By the end of next week, I ______ here for 20 years.